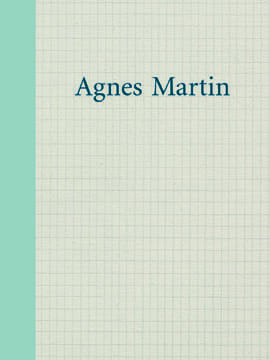 Finally—a book of criticism about Agnes Martin. No other book of writing about this singular, revered artist has been in print for many years. And though Martin (1912–2004) has been an esteemed presence in the art world since at least the early 1960s, there exists no monograph, no biography, no previous collection of criticism. Martin and her artwork have long had much to offer to artists; to those engaged with art history, intellectual history, and social culture; and to all curious about the rough business of being human. Agnes Martin touches ably on all of these categories of inquiry. Ten essays, written by a variety of commentators in diverse rhetorical styles, will engage any admirer of Martin’s work. They establish art-historical contexts for her painting, investigate her work process and her life, and connect her aesthetic project to social movements and theoretical frameworks. Articles have illustrations beyond the thirty color plates showing Martin’s spare, luminous abstractions of elemental geometries, rendered in finely calibrated palettes and textures. While this volume surveys new directions in scholarship, it also opens the way for further publications that should not be so long in coming. The timing and provenance of this tastefully designed volume situate it within recent assessments of Martin’s oeuvre. Yale University Press copublished the anthology with the Dia Art Foundation, the institution where Lynne Cooke, one of Agnes Martin’s three editors, curated a multipart Martin retrospective from 2004 through 2007. In 2006 Pace Gallery, Martin’s longtime dealer in New York, held an exhibition of early and late works that showed Martin wrestling with forms beyond the grids and bands for which she is renowned. In fall 2011 Pace showed a series of gray paintings from the 1980s that had not been seen for twenty years. A back room featured paintings whose opacity contrasted forcefully with the airier, more familiar canvases in the main space: Martin could extract infinity from density. As I write, Martin’s 1979 suite of glowing paintings The Islands is showing in the Singular Visions exhibition at the Whitney Museum of American Art. The University of New Mexico’s Harwood Museum of Art in Taos, Martin’s final home, is marking her centenary with Agnes Martin: Before the Grid, a groundbreaking exhibition of rarely seen early works. In early 2013, the Albright-Knox Art Gallery in Buffalo, New York (where chief curator Douglas Dreishpoon is a longtime Martin devotee), is due to show Agnes Martin: The New York–Taos Connection (1947–1957), organized by the Harwood Museum’s curator, Jina Brenneman. The Harwood, site of a Martin archive and a specially designed, permanent “chapel” housing a set of seven paintings, hosts annual events on the artist’s birthday: this year’s modest, spirited centenary symposium reinforced the anthology’s achievement, dismantling myths and introducing new perspectives. Books by and about Martin have been published, but all are rare. An elegant paperback of Martin’s elliptical homilies and lectures, Writings/Schriften, appeared in conjunction with her 1992 retrospective at Kunstmuseum Winterthur. Authors in Agnes Martin quote liberally from these poetic pronouncements on persistent themes such as perfection, humility, inspiration, emotional response, and the artist’s life and mind, all of which unfold from Martin’s homespun mix of classicism, Zen, mysticism, Taoism, and love of nature. Old exhibition catalogues contain critical articles and facsimiles of original manuscripts; the closest kin to the current anthology is an expanded catalogue from another 1992 retrospective, at the Whitney Museum. That volume contained informative, rigorous essays by Anna C. Chave, Barbara Haskell, and Rosalind Krauss. Though only Krauss’s “Agnes Martin: The /Cloud/” has been reprinted elsewhere, these essays—and several others—are shadows haunting many authors in Agnes Martin.1 A companion volume to this anthology would republish the catalogue essays by Chave, Haskell, and Krauss, along with articles by, at least, Lawrence Alloway, Dore Ashton, Lizzie Borden, Benita Eisler, Briony Fer, Thomas McEvilley, Annette Michelson, and Ann Wilson. Criticism cited less often in the current anthology would also belong: texts by Lynne Cooke, Holland Cotter, Hilton Kramer, Brendan Prendeville, Peter Schjeldahl, and probably others. The canonical essay by Krauss is also haunted: it is structured around a short Artforum article by Kasha Linville from 1971.2 Linville’s “Agnes Martin: An Appreciation,” an ur-text of Martin criticism, should definitely recirculate: over half of the writers in Agnes Martin refer to it. Linville writes effusively and precisely about her phenomenological responses to Martin’s paintings. As Rhea Anastas observes in this anthology, Linville’s approach contrasted with other reviewers’ mathematical and “materialist description,” and established a trend of impressionistic writings about Martin’s paintings (133–34). Linville’s vibrant, direct encounter with artworks is echoed in this volume by Christina Bryan Rosenberger’s technical study of how Martin’s works “achieve maximum visual frisson through her subtle manipulation of materials” (111). The most conscientious reassessment of Linville appears in Anne M. Wagner’s essay: Wagner retraces Linville’s steps, revisits her observations, and tests Krauss’s analyses. Michael Newman performs an analogous reappraisal of Krauss’s influential essay, dissecting each allusion and argument, and thereby revisiting Linville’s work as well. Douglas Crimp also writes extensively about Linville: her review was occasioned by the 1971 labor-of-love exhibition he organized at the [School of] Visual Arts Gallery in New York. Crimp, fittingly, is the first essayist in Agnes Martin, following Cooke’s solid introductory overview of Martin’s life, works, and art-historical setting. His position is appropriate not only because he embodies the ghosts of Linville and Krauss—he was Krauss’s graduate student in the 1970s—but also because he frames a question that animates many of the essays that follow: what is the emotion that fuels Martin’s abstractions? His essay’s title, “Back to the Turmoil,” recalls Martin’s unwavering claim that she worked, like the classical philosophers, with her “back to the world.”3 Crimp is astute in objecting that “surely it is the turmoil away from which Martin turned . . . that constitutes the tension so many of us see in her paintings” (68–69, emphasis in original). He encourages critics to turn (back) toward whatever disturbances Martin was trying to avoid. In taking up this challenge, many of the anthology’s writers bump up against the unremitting recalcitrance that Martin and her allies have maintained about her life: the biggest shadow haunting Agnes Martin is the artist herself. The most ambitious attempt to break this silence is Jonathan D. Katz’s essay, “Agnes Martin and the Sexuality of Abstraction.” Katz’s multilayered inquiry probes how Martin’s sexuality played out in her artwork, writing, and life in the wake of McCarthyism’s Lavender Scare. In a footnote, he also hints at the “turmoil” that occasioned Martin’s adult dependence on psychiatric medications. The artist Zoe Leonard best explains why Katz’s article is so important. Though she is fatigued with the subject of sexuality, and “keep[s] resisting talking about [Martin] as female or speculating about whether she was queer,” Leonard realizes that she “can’t help but wonder what role gender played in Martin’s artmaking,” and concludes, “Somewhere in the work, informing the work, is a biography of a person. A person who lived, as we all do, with the specifics and complications of her own desire . . . a woman, in America, at a specific moment in history” (98). To know Martin’s personal history is to gain a perspective on how to juggle the contingencies of life and art. At his best, Katz weaves rich interpretations of Martin’s artworks and writings, using pertinent quotations from Gertrude Stein, Zen, and classical philosophy. He locates the positive spin that Zen places on silence and shows how unspoken homosexuality could thereby figure not as repression but as liberation. He botches a distinction—Buddhism’s canniness about sensory perception is not equivalent to Platonism’s flat-out rejection of the physical world—and this seemingly minor glitch makes some key arguments unconvincing. Nonetheless, the scope of Katz’s vision and the intricacy of the research he has done to inform it are courageous and laudable. Expedient oversimplifications function like new mythologies, and should not replace the existing mythologies or silences about Martin. The artist herself insisted on leaving aside her personal history, demanding that public attention be focused instead on her artwork. What was her logic? Does it still pertain, or should we disprove it? Can we effectively weave detailed and probing biographical information into sustainable interpretations of artworks? Overall, Katz’s article answers this question with a provisional yes. Still, if he were more careful in his treatment of Martin’s sexuality—facing squarely the complexities inherent in what is known about Martin’s life and acknowledging what is unknown (and perhaps unknowable)—his interpretations of her work in this context would be more reliable and useful for art history. As it is, his dogmatism threatens to overwhelm, and undermine, better parts of his essay. A potential site for mixing psychosexual biography with art criticism is suggested by a preoccupation of several essays: the physical qualities of Martin’s paintings. How does Martin achieve such an extraordinary blend of the material and the immaterial? Some say that her handling of various mediums yields a mute, purely physical experience: Newman refers to Paul de Man’s “conception of radical, indifferent materiality” (209). Katz is also useful here. Might such a materiality be informed by Martin’s sense of her body—by a disjuncture between mind and body, even by a sense of dismemberment? How does this relate to the “pleasure” that Leonard and Newman see in her works (95, 222)? Such lines of inquiry could delve into Martin’s psychiatric history as well as into her sexuality, while invigorating formalist observation, plus inspiring new understandings of Martin’s art and the materiality of painting. Several essayists mention Stein, but others associate Martin with less predictable cultural figures and ideas. Hanne Darboven shares a practice of repeated inscription (in Newman, 214); the human scale of Martin’s canvases echoes Leonardo da Vinci’s Vitruvian Man (in Hudson, 121); Eva Hesse and Sol LeWitt use graphite and grids, following Martin’s example (in Crimp, 65). Piet Mondrian appears too briefly and obliquely (in Newman, 203 and 224n9).9 Wagner, Newman, and Jaleh Mansoor see textuality in Martin’s grids, and their analyses are riveting.10 Newman combines Christian theology with Lacanian linguistics in this pithy gloss on Martin’s grids: “Repetition, as emptying out, in prayer allows the saying to accord with the unsayable” (218). Wagner introduces cybernetics and chaos theory to great effect and makes a strong case for newfangled parallels to define “the work’s enduring contemporaneity” (237). Some of the writers situate Martin’s signature works in fascinating new social and theoretical contexts. Mansoor contrasts the procedural structures that generate Martin’s paintings with the rigorous philosophies of chance that motivate John Cage’s and Marcel Duchamp’s distinctive production processes. In her exceedingly well-crafted essay, Mansoor writes that, in contrast to the conventional view of inscription as individualistic expression—or even as the positivistic outcome of a chance operation—Martin’s “negation of the [mark-making] gesture as an act of enunciation” (158, emphasis in original) serves the artist’s “model of humility and subjectivity critical of the primacy of the self” (157). Martin’s implicit critique of her peers’ “ego or virtuosic authorship” (160) aligns her work with feminist and structuralist epistemologies. Given Martin’s resolute abstraction, the feminist connection is not overt, yet Mansoor sees it as nonetheless pervasive. She determines that Martin is “too engaged in a feminist relation to practice, perhaps, to objectify and label it as such” (166). In another agile essay, Hudson uses Martin’s portfolio of sixteen prints, On A Clear Day, to prompt an interrogation of Martin’s relationship to nature, including human nature. How can we make sense of her many nature-based titles, given that “Martin actively refuted claims that her paintings referred to nature” (123)? Hudson notes that “a clear day” describes a mental state as well as a meteorological condition: Martin intertwines the corporeal and the incorporeal. Hudson then uses two popular books from Martin’s New York decade—Rachel Carson’s Silent Spring and Abraham Maslow’s Religions, Values, and Peak-Experiences—to situate Martin’s project between a disembodied environmentalism and a spiritualized psychology. Along the way, Hudson also offers the most witty remarks I have seen about Martin’s writings and oratory, gently yet studiously calling into question “the coherence of her assertions, not to say their suitability relative to the paintings themselves” (123). Not all of the writers’ theoretical projects are so thoroughly successful. Ambitiousness is the downfall, yet also the best quality, of Anastas’s essay, “Individual and Unreal: Agnes Martin’s Writings in 1973.” Anastas tries to compare Martin’s ideas about the self with those of the modernist writer Laura Riding, despite the fact that “neither an artistic or historical context nor any evidence of contact can be named to connect Riding with Martin” (136). The pairing is indeed a serious stretch: Anastas suggests that the artist’s “self-reliance” as formulated by Riding (139) can map onto Martin’s rule that the artist remain separate from society, but the poetc solipsism implied in Riding’s writings contrasts utterly with the self-effacement called for in Martin’s.11 Still, experimentation with unexpected—even jarring—juxtapositions has the potential to be fruitful for gaining an expanded sense of Martin’s oeuvre, especially given that her work has too often been treated as insurmountably autonomous. Clearly, there is much yet to be said about Martin. The process of further excavating her work and philosophy is well under way: Arne Glimcher’s compendium of archival documents, Agnes Martin: Paintings, Writings, Remembrances, another landmark volume, has also been published in this centenary year. Glimcher’s book presents many of Martin’s previously unpublished manuscripts along with his own memoirs of years of interaction with the artist. Meanwhile, anthology contributors Hudson and Rosenberger are also writing books. Rosenberger’s will deal with Martin’s early work, building on her informative tour of the Harwood’s Before the Grid exhibition in which she compared Martin’s early abstractions to those of Joan Miró, Arshile Gorky, and Louise Bourgeois. The critic Nancy Princenthal and Martin’s longtime friend Herta Wittgenstein are working on biographical monographs, and Becky Hunter is expanding her centenary symposium research on ambivalence and existential absurdity in Martin’s early critical reception. Mona Schieren will publish on the influence of Asian and Native American philosophies in Martin’s oeuvre and is planning a symposium in Germany. Taoseño Luis Jaramilla, who prepared Martin’s canvases in her later years, also aims to publish a book . . . and these are only the projects I have heard about. It would be excellent to see an anthology of interviews, too—with Martin and with others about Martin. These unscripted quotations would supplement the fragments that spice the anthology and would allow Martin to become better understood. My review would not be complete if I did not mention the most complete overview yet to come: Martin’s digital catalogue raisonné from Artifex Press. This innovative resource will make available online complete information about all Martin works that can be located. Ideally it will include a searchable bibliography—the one in Agnes Martin is arranged by year, instead of author, so it is difficult to determine quickly who wrote about her most often. Agnes Martin does not purport to be a complete resource. Nor does it aspire to quantify Martin’s contribution; it qualifies it. At root, this requires the essayists to sum up Martin’s visual art in the art of language. So I will quote two evocative descriptions: may they send you back to the book and to the paintings themselves. Cooke, the curator, describes the experience of moving in front of a 1960s canvas: “The image seems to coalesce into a velum, a haze, or a halation—a visual tremolo or a blush of refulgent color” (13). And Leonard, the artist, again: “There is always this hum, this thrum. This quiet, constant push, of light to dark, of beat to beat. Of rain soaking into soil” (85). In addition to the excellent writings in Agnes Martin, the immediate, visceral qualities of her work endure. Karen L. Schiff is a visual artist who lives and works in New York and has a studio in Brooklyn. www.karen-schiff.com. Previous What Are You Working On?